The Air King Commercial Grade Oscillating Wall Mount Fans are ideal for workshops, health clubs, stores, classrooms, offices and other areas where there is limited floor or table space. 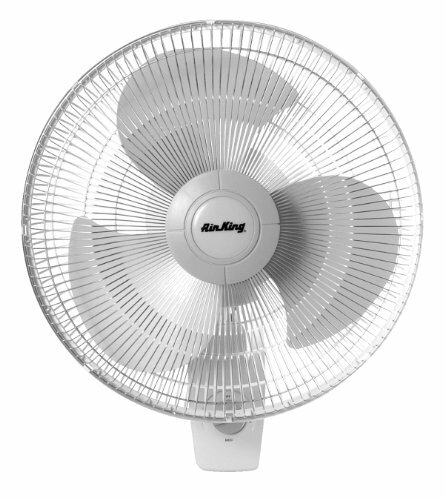 Model 9016 is an 16 Inch, 3 blade oscillating Wall Mount Fan. The motor is 3 speed, 1/20 HP, 120V, 1 phase, permanently lubricated with a permanent split capacitor. Controls are front mounted - rotary and pull cord switch. Power cord is a white, 7 foot, 3 conductor. SPT-2-R type. Metal front grill with impact resistant plastic rear grill and chemical resistant polypropylene blade. Oscillation is 90 degrees and can be locked in non-oscillating position. CFM 1,7100, 1,500, 1,330 (High, Medium, Low) RPMs 1,545, 1,394, 1,244 (High, Medium, Low) Amps .71, .54, .48 (High, Medium, Low) Watts 114, 85, 63 (High, Medium, Low). ETL and OSHA compliant, Tested in accordance with AMCA 230.99. Air King offers a full line of industrial grade and commercial grade air circulating fan solutions to meet almost any need you might have. Whether your need is in industrial settings such as manufacturing plants and warehouses or more commercial setting such as offices, schools or hospitals, Air King has the perfect solution for you. Quality, energy efficient and durable Air King products are always a great choice!